Dili, Timor Leste’s dusty capital, can be a challenge for the few who bother to travel here. Its history - both centuries long Portuguese colonial rule, and its more recent turbulent path towards independence - is rich, and alive. And the people are excessively friendly. But generally, its a hard city - I found - to fall in love with. Getting around is a hassle. Food and accommodation is outrageously expensive for anyone on a backpackers budget. And it is, frankly, hardly the most beautiful city in Asia. Nestled along kilometres of beaches and at the feet of towering green peaks, it has ingredients that can make a city magical. But its polluted waterways and littered streets often sour otherwise colourful and boisterous neighbourhoods - particularly those that hug the shoreline. I spent much of my time in Dili in Beto Tasi - a semi-rural community by the city fringe - luxuriating at what I was told was the city’s best beach. But, while Beto Tasi Beach - a pebbled, rough stretch of coast - has its charm, the city’s finest swimming spot lies at its furthest eastern fringe. Looking back towards Dili from the foot of the statue. 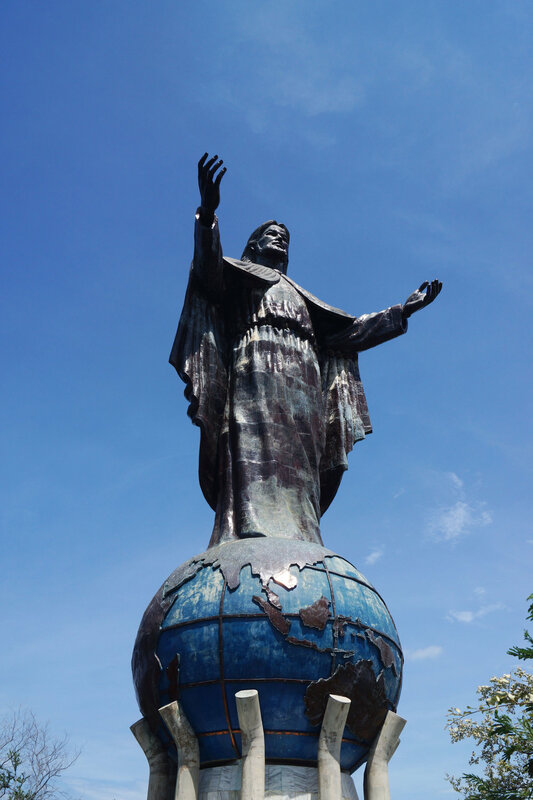 I was on a day trip to Christo Rei, the 27-meter tall statue of Jesus Christ that looks towards Dili from its perch at the end of the Fatacuma Peninsula. The statue was ‘gifted’ to the East Timorese in 1996 by Suharto’s Indonesian government, a small gesture of goodwill after decades of brutal occupation that one third of East Timor’s population didn’t survive. I’m usually relatively disinterested in religious statues. But I’d been holed up in my Beto Tasi beachside house for a few days working, and was getting stir crazy. 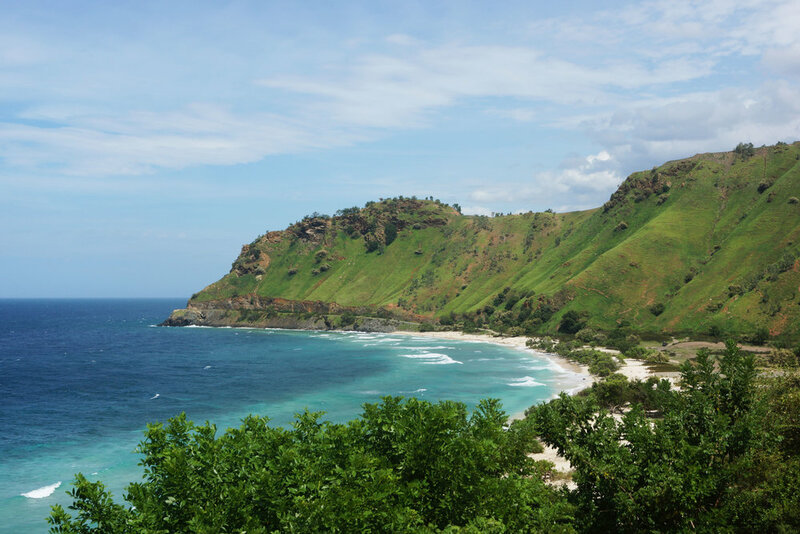 As one of Dili’s few ‘attractions’, I reasoned it would be worth making a day trip of it. After an embarrassingly Western lunch at Castaway Bar by the central Dili foreshore, I haggled with a cab driver to take me to the statue for just $5. But for those with the time and energy to battle the intense Dili heat, the statue is about two hours walk along the coastal road from central Dili. Another option is the 50 cent microlet (local minibus). These buses are everywhere in Dili - and they go everywhere. But, unless you have a good grasp of Tetun, the local language, it’s extremely hard to figure out where each one is going. The taxi snaked slowly along the Dili foreshore. As it inched further from the city’s heart, the tepid, flithy sea slowly lost its potency, the shades of grey and brown ceding to bright blues and crystal clarity; the trash left behind in the city. Christo Rei beach, looking towards Dili. The hidden beach behind Christo Rei from the stairs leading to the statue. Christo Rei itself is not particularly inspiring for those of us who aren’t believers. But the walk and surrounding mountains are undoubtedly Dili’s best feature. Just behind the statue, a deserted white sand beach, enveloped by towering green mountains, is tucked away - a perfect place to spend an afternoon, in blissful seclusion from the frantic atmosphere that is inescapable in central Dili.